That look might work on a 14-year old Japanese girl in the Shibuya or Harajuku, but looks somewhat contrived here. 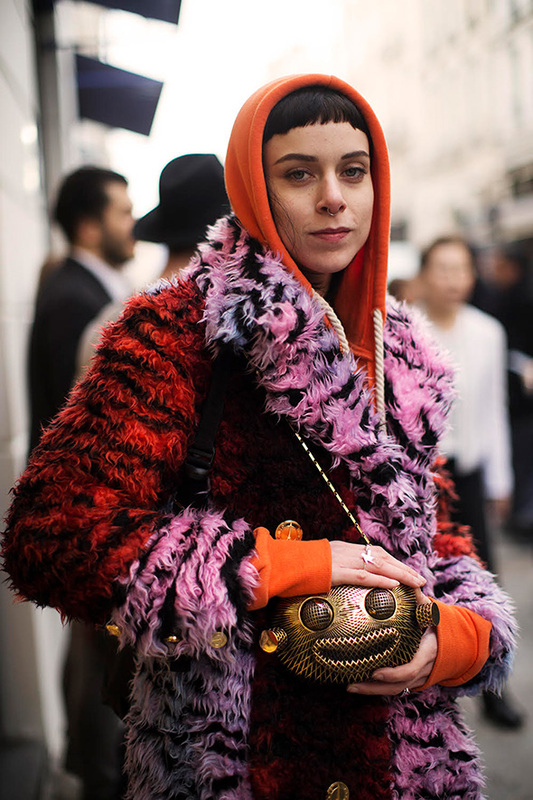 Happy and gorgeous in her own style…love to see more of her…she made me think of Anna dello Russo! I don’t think so it is trying too hard. Chic color story happening – love it! This is what I’d go to Paris for. To see true fashion sensibilities like this. Way out there. love it, what a fun look! love her purse! Bold fringe action. Super look. I love how she is proudly showing off her handbag in her pose. Whatever anyone else thinks, she looks like she feels great! Isn’t that the point of fashion? Everything works and looks perfect. Her bangs, the beautiful colors, the orange hoodie and the beautiful purse.